It was quite exciting today as this year’s Sarah Fielke Block of the Month started. It’s a gorgeous quilt of houses, cottages, trees, as soon as I saw the design I signed up. Sarah was the designer of Down the Rabbit Hole quilt which I’m quilting at the moment, so I know her designs are wonderful and her instructions are great. I tried very hard to veer away from my usual quiet palettes of colour, I went to a quilt show with a completely open mind…and came home with a subtle collection of fabrics in teal, grey, adding a little purple (of course!) and peach. 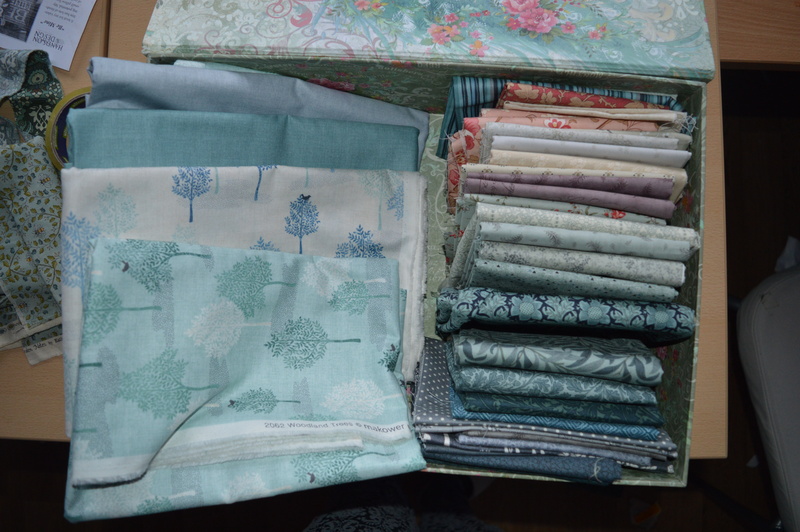 I found my background fabrics later with the trees on together with a couple of plains in light teal and grey. As a lead up to the start of the BOM, Sarah suggested we made a fabric block book to store both our finished blocks and work in progress too. She released a video to show us a simple way to make one. I finally got round to sewing mine yesterday, just in time! Sarah used an orphan block for the front, I haven’t got any orphan blocks so I raided my stash for some sewing themed fabrics. I bought these ages ago on a whim and then wondered what on earth I was going to do with them, this was the perfect project to use them. I even had just enough of the tape measure cotton tape left in my stash for the ties. The book was very straight forward to make with cardboard inserts front and back and pages of batting which acts like fuzzy felt for work in progress and finished blocks. My main difficulty was trying to persuade my twenty year old sewing machine that it could stitch through six layers of batting, necessary to make the spine. It flatly refused at first – I got that STOP IMMEDIATELY FOR SAFETY sign! I lengthened the stitch and tried it with just three pages, it stitched OK. I did two sets of three and then put one on top of the other and it happily stitched all six together!! It didn’t even complain when I added the two layers of fabric for the cover – I think it was just feeling it’s age at first! The only change I made was to add two handles to the book. It measures about 13″ square and I can see myself using it to carry work to sew at Embroiderers Guild or when visiting my mum. Handles will make it a lot more convenient. I’m really pleased with my book, I’m actually tempted to make another one as I’ve now got three BOM’s on the go and another one would help keep things organised. So now I need to choose the fabrics for the centre of my quilt and make the first eight houses. This entry was posted in Coming Home Quilt, Quilt-a-long, Quilting and tagged #cominghomequilt, #sarahfielkebom, Coming Home Quilt, Quilters Block Book. Bookmark the permalink. That block book is a good idea for both storing and transporting blocks.. Is there a link to the video or is it just for those who have signed up for the BOM? Hi, the block book video is just available to those who’ve signed up, though it’s just a simple book with batting pages. I don’t think anyone will ever persuade you to use bright warm colours, will they? 🙂 I had a little bet with myself about what you’d pick, and it didn’t feature reds and yellows… It’s going to be lovely, it’s definitely in ‘your’ colour palette. 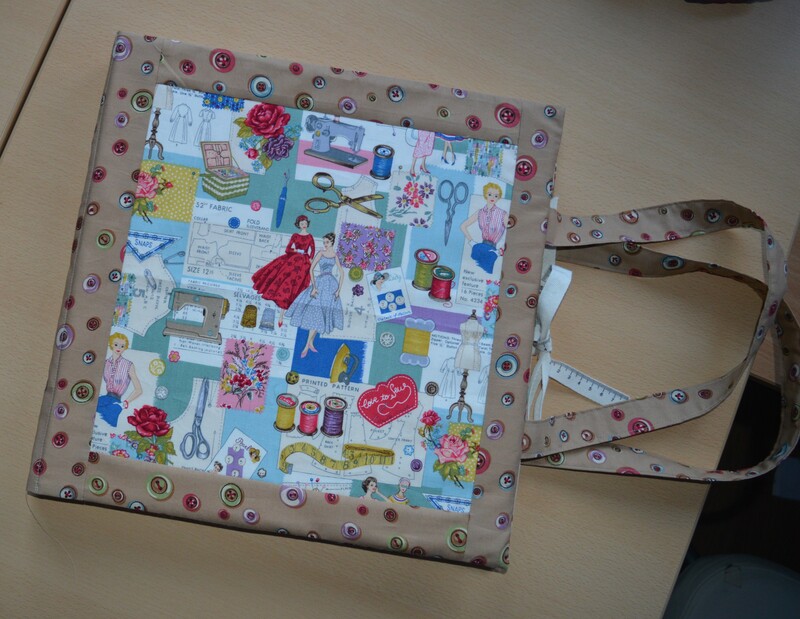 The block book is lovely, and a perfect use for fabric you like but won’t use anywhere else. A friend of mine made herself something similar, but she bound the page edges, as she said she was worried about the batting catching on things and pulling apart, and she didn’t use card as she wanted to be able to roll it up. I like the crispness of the firm covers, myself. Now I did make a yellow and red quilt last year, though it wasn’t for me 🙂 Bright colours just wouldn’t work in our house, I admire bright colourful quilts hugely, just don’t make them…one day! For many years I did have a red room, I loved ‘the red room’ but even that was a luscious ruby red, rather than a firey orange red, it was my quiet room full of books and my piano. 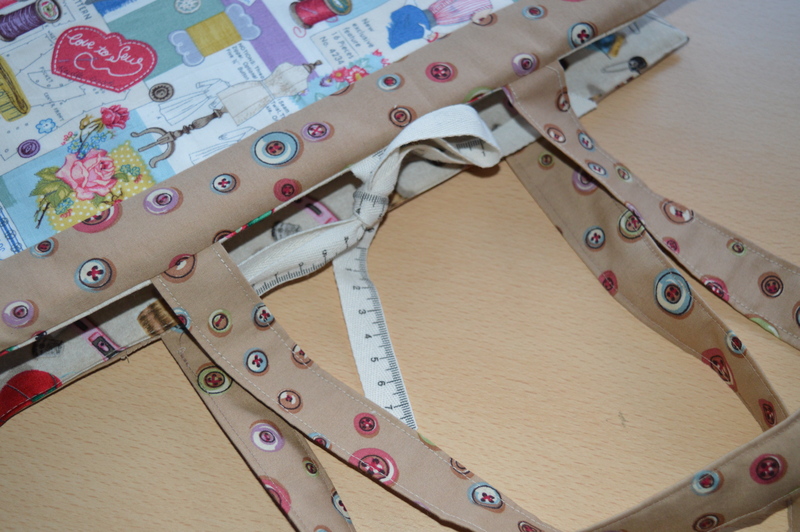 I love your sewing prints, and what a great way for transporting your projects! Oh, clever book! So impressed. 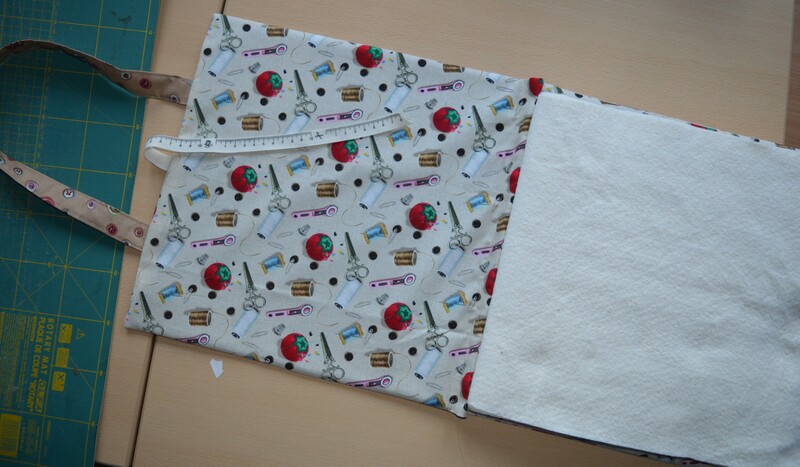 You need to do a book for people to purchase, on making fabric books! Excellent fabric for the carry all book. Your add-ons always makes enhance a project. That’s a very nifty book! It could be useful for so many sewing projects! Ethics again, I’m finishing DTRH too and excited to be starting Coming Home. Just for interest, I used Bozal instead of cardboard and it works well. Love all your colours. Good luck. I am going to add some of my precious Liberty fabric. Best of luck. Thanks Jane, I can imagine bosal would be pretty good, I think I’ve used it once before. Should read “hello again”. Ethics????? Predictive text! That’s awesome! I love the ribbon and button fabric!